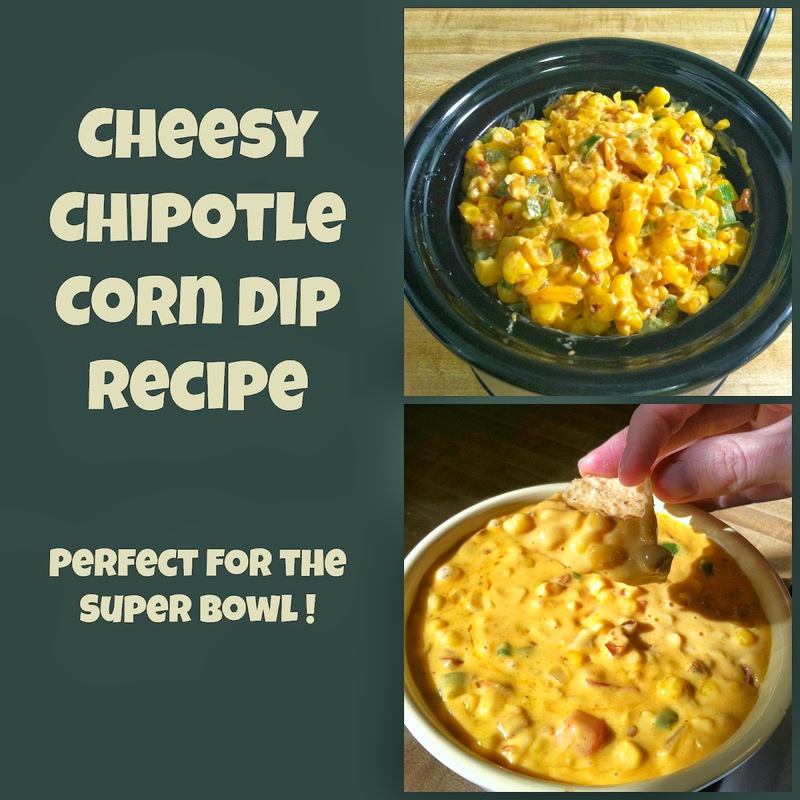 It's almost time for the Super Bowl which is a great time to try out a new dip recipe. Or in my case a good time to play around with a recipe until I get it right just in time for a Super Bowl recipe. There are some recipes in my house that are classics, like my 5 layer dip recipe that get served often at parties. But I like finding new recipes to try out for the Super Bowl. We always make tons of appetizers to eat with the game. I love this dip! It's creamy with just a little bit of smoky spice from the chipolte peppers. It's a very easy dip to put together and best of all, the ingredients are real! I love queso made from fake cheese as much as the next person, but we are trying to eat more real food and less processed food. The first time I made this dip my husband said it was delicious but needed more heat. I agreed with him but I also wanted a creamer texture. I added more chipotle peppers and milk the next time I made it and it came out perfectly! Just to be sure it was right, I made it a third time. You know for research not because I was craving it. Eating dip and chips for lunch is perfectly acceptable when it's done in the name of research. If you don't want your dip too spicy, add 2 chipotle peppers and then add more until you get the heat you want. I used 4 but I love spicy food so you may not want that many peppers. You can use any color of bell pepper. I like using red and green since it makes the dip colorful. If you're having a large crowd you'll want to double the recipe. 1. Heat a large skillet over medium/high heat. Add the oil and heat. 2. Add the peppers and onions and season with garlic powder, salt, and pepper. I use about 1/8 t of salt and pepper. Saute until the veggies are soft. About 5 minutes. 3. Stir in corn and chipotle peppers and cook for 5 minutes. Remove from heat. Use gloves when you handle your chipotle peppers or your fingers will burn for hours. At this time you have two options. You can stir in the cheese, mayo directly in the pan. Once the cheese is melted add in the milk and pour into a bowl and serve. Or you can mix everything in a Crock Pot and cook on low for 1 hour. I like the Crock Pot option for parties since this is a dip that must be warm to enjoy. Once the cheese is melted, serve with tortilla chips and enjoy! I love corn dip, but this takes it to a whole new level! Thanks for sharing! I found you at the Fluster Buster linkup. Oh, how I could polish off a bowl of that with corn chips! It sounds amazing! This is making my mouth water. I have to make this. I just have to. Excuse me while I clean up my desk and write down the recipe! 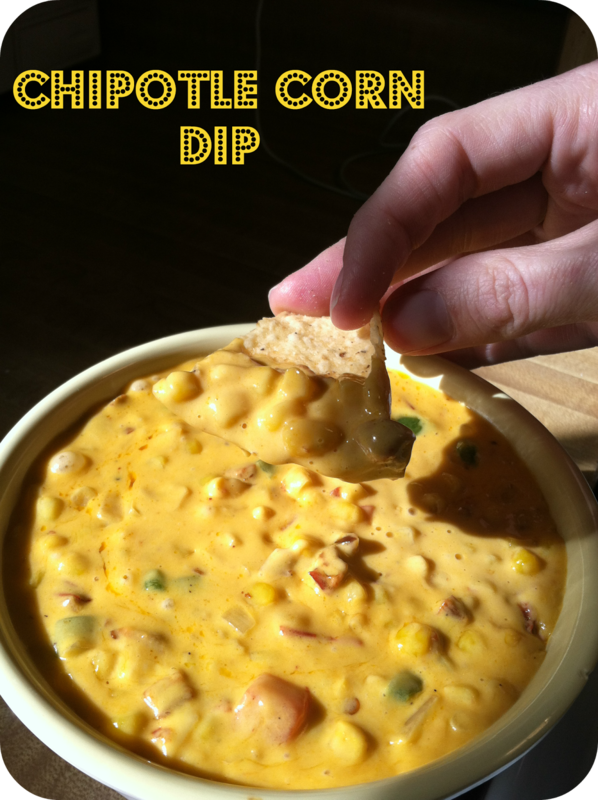 I love a good dip, especially a cheesy one! This looks delicious!